So far in our series on retirement annuities, we have discussed many aspects of annuities, especially the fixed index annuity. We have covered the four types of annuities, fixed index annuity basics, principal protection, and multiple annuity crediting methods including point to point, monthly sum, and monthly average. 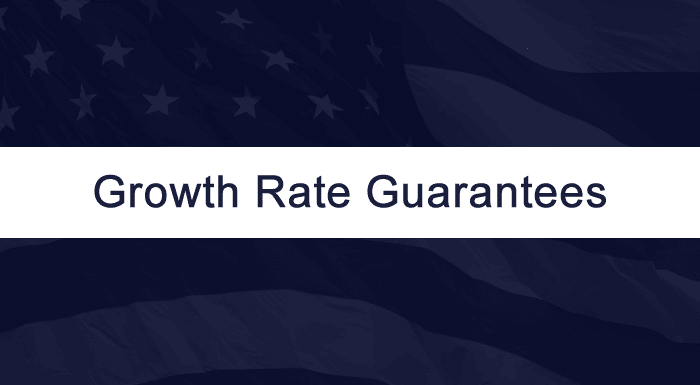 Next, in our series, we will discuss annuity growth rate guarantees. Over the past several years we have seen the stock market go pretty much all over the map…everywhere from 50% downturns to record highs…and everywhere in between. And who knows where it’s going to go next?! With all this volatility in the stock market, you may find yourself looking for predictability and guarantees when it comes to income for your retirement years. One of the ways Fixed Index Annuities take the guesswork out of planning for your retirement is with the growth guarantees that come with income riders. A Rider is an enhancement package you can add to an annuity contract. When you have an income rider, your annuity will have a separate income value…which is the basis for your lifetime income payments and is not available at any time as a lump sum. The income value is designed to grow faster than your annuity’s cash value, which helps you maximize your lifetime income. For more see, Growth and Income Annuities. Whereas a basic Fixed Index Annuity contract package doesn’t usually have any fees, there may be a cost associated with an income rider. The fee can range from around 0.5% to 1.5%. In most cases, the fee is deducted from your cash value on an annual basis. Just like there are different kinds of annuities, there are different kinds of income riders. When choosing the one that is best for you, you’ll need to consider not only the cost…but also the types of guarantees provided, as well as the timing of when you plan to start your income stream. I highly recommend you work with an annuity specialist who has access to all the different companies and plans that are on the market…and who understands the ins and outs of how to leverage the benefits of each type of rider. 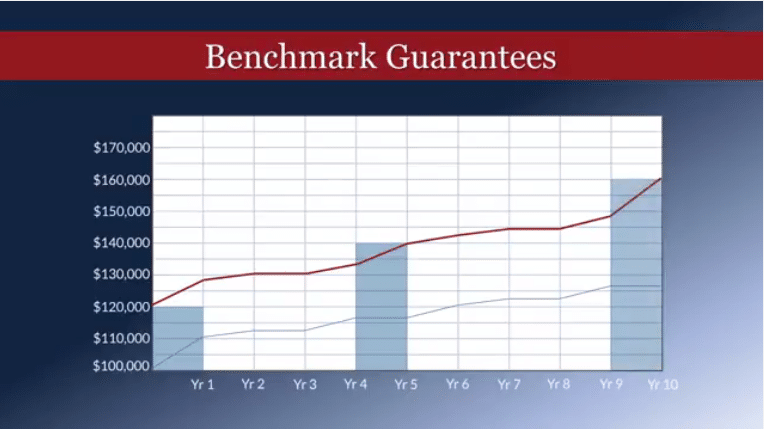 Some income riders provide benchmark guarantees on an annuity’s income value. An example might be an immediate guarantee of 20%, with an additional guarantee of another 20% at the 5-year mark, and another 20% at the 10-year mark. Another feature that can be part of an income rider is a guaranteed annuity increase rate…commonly referred to as a roll-up rate. This is a minimum guaranteed interest rate your income value will earn. As an example, let’s say you have a rider that guarantees 7% interest compounded annually. 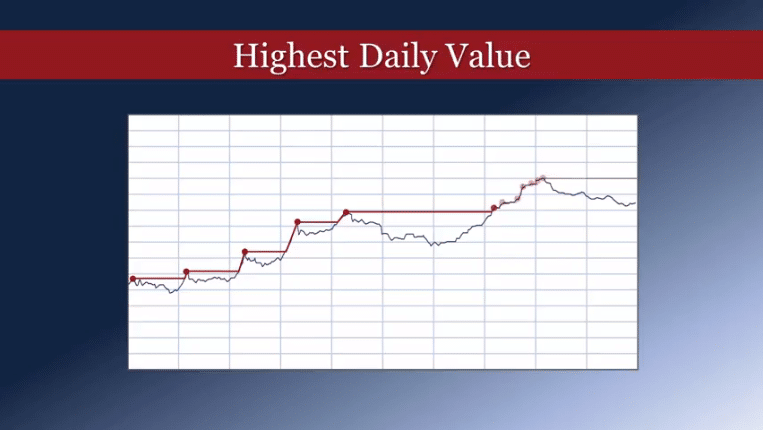 If the indexing options you choose do better than that 7% rate over time, your income value will earn the higher rate. But, if the market performs poorly – even if there was no growth in the market at all for ten years – you would be guaranteed to have almost doubled your income value over that 10-year period. In our last article, we looked at crediting methods, and you may remember that in Fixed Index Annuities gains lock in at the end of each crediting period. With another type of income rider, your highest daily income value is automatically recorded and locked in – you don’t have to wait until the end of the crediting period. This feature can be especially attractive when the market is very volatile… as you can see in this example. Keep in mind, your annuity’s income value is just half the equation when it comes to calculating how much your income checks will be. When you are ready to start your lifetime income payments, the insurance company takes your income benefit value and multiplies it by the payout factor specified in your contract. In our next article, we’ll take a closer look at payout factors and how they can have a big impact on your retirement future. This blog series on retirement annuities is part of our 8-part video series called “Securing Your Retirement Future.” Our videos are designed to help you learn everything you need to know about annuities––from fixed index annuity basics to more advanced topics such as annuity payout rates, the various types of crediting methods, principal protection, and much more. If you have any questions, we are here to help. Give us a call at (972) 473-4700, or you can schedule a face-to-face appointment here if you are planning to be in the Dallas/Fort Worth area.